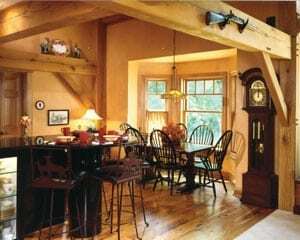 “After I’ve been away for a few days, I love coming home to the familiar scent of wood”,says Tom Dillon, describing what it’s like walking into the timber frame home he shares with his wife Dee. 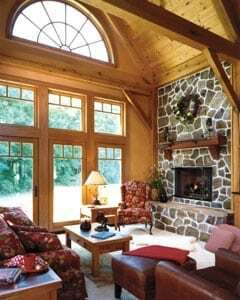 Tom and Dee selected the “Tecumseh” stock plan from Riverbend Timber Framing, located in Blissfield, Michigan – and the frame for the 3,000 – square – foot home was raised in just under three days. The way the numbered timbers matched and connected was like seeing a massive Tinker Toy set in action. The home’s fresh-cut oak ‘timbers have a warm honey color, and it was essential to get the frame enclosed as quickly as possible to protect that beautiful hue. Moving efficiently during the winter construction, builder Michael Bassinger of Bassinger Building Company in Lambertville, Michigan, completed the roof just one day after framing. Over the next few weeks, Riverbend installed the company’s own precut structural insulated panels called Insulspan SIPs. Green timbers (those with a naturally high moisture content) are easier to work with during the building phase, but may twist and shrink a bit. For example, a 12-inch green timber can shrink up to one-half inch after construction. However, experienced professionals account for this during design and construction, and it’s never problem. “Building a timber home is tricky,” says Michael. “You have to allow the frame room to move. 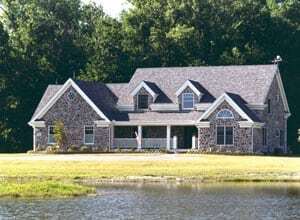 The envelope around the house must not be attached to the beams.” To that end, Michael attached all of the home’s trim to drywall, Insulspan panels or flooring-never to the timbers themselves. This leaves the timbers free to pull away as they shrink, and the trim neatly hides any gaps. While the layout includes a loft with two bedrooms and two full baths for a son and daughter still living at home, the main level holds the master suite, sitting room, kitchen and an additional full bathroom off of the pantry. The big advantage of this flat terrain: accessibility. “After caring for my mother who was wheelchair-bound, it made me appreciate how nice it would be to have a home that’s easy to negotiate,” Dee says, noting that they redesigned the master bedroom to include a walk-in shower. The couple decorated the home in a classic country style-primarily with furnishings they already owned, including several beloved Queen Anne chairs. “We went from a large house to this relatively small one, so we had to prioritize when we decided what to keep,” says Dee. To round out the home’s decor, she chose a few new accents, such as a pair of mica sconces that glow along the second-floor catwalk, and also painted the walls a soft gold color. “I’ve seen oak timber homes with white walls that make the wood look extremely gray,” says Dee. “I’ve never understood this, especially when this home is all about warmth.” With some impeccable touches throughout the home, along with the decision to build with timber, the couple has guaranteed a warm aesthetic for years to come.